Are you are a blogger and you wish to display about you, as the the Author of the blog, below all your post in Blogger, then this tutorial will show you the simple way to do it. As a Blogger it’s very important to tell the his audience who is the author of the blog and "About the Author" is the best & most successful way to make awareness among the users who is the behind the success of this blog. Maybe you have seeing it in many Blogger or WordPress blog which has About the Author Widget below every post. You can customize CSS code according to your template style. To change background color of the Author Box Replace #FFFADF to your colour choice. To change border color Replace #FFD324 to your colour choice. 3. Now Save the Template . 1. To Insert Your Author's Image simply Replace https://lh3.googleusercontent.com/-xAIafhcIE78/AAAAAAAAAAI/AAAAAAAAAF8/6MsBK4HmQVU/s120-c/photo.jpg with your image. 4. Now after Customizing your Author box according to your need simple Save the Template and now you will be able to see "About the Author box" below all blogger posts. Get more info about blogger here. 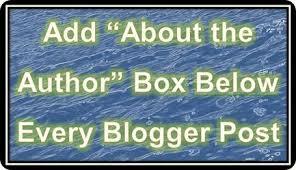 I hope this tutorial have helped you in learning how to Insert "About the Author" Box Below All Post in Blogger. If anyone find any difficulty then don't be shy to make use of the comment box below.